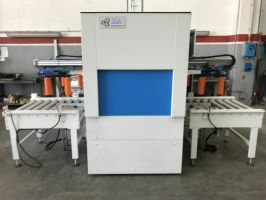 THIS MACHINE WAS DESIGNED AND BUILT BY SGA IN ORDER TO FLATTEN THE LOWER EDGE OF FLOW FORMED WHEELS THUS AVOIDING THE PRELIMINARY TURNING AND ACHIEVE THE OBJECTIVES OF SAVING AND THE INHERENT IMPROVEMENT OF WHEEL DE-BURRING. THIS MACHINE CAN PROCESS WHEELS UP TO O.D. 22"x H13"